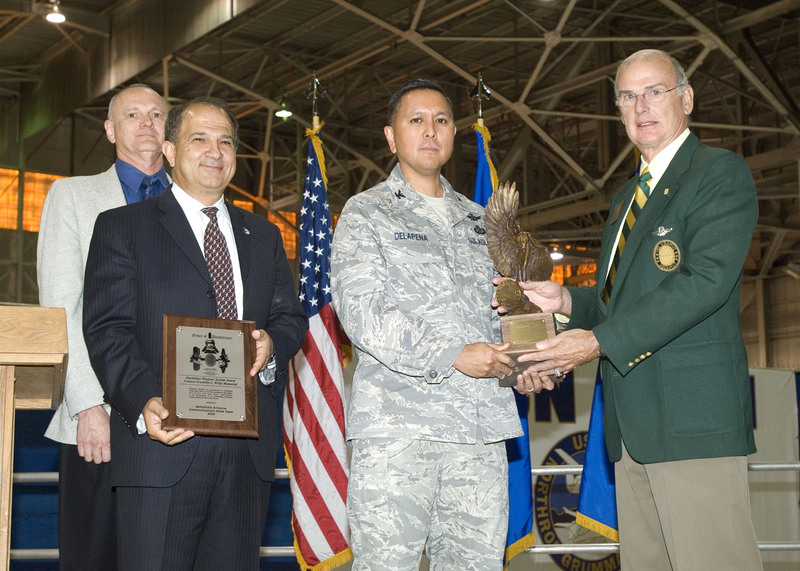 EDWARDS AIR FORCE BASE, Calif., Dec. 6, 2010 -- The Battlefield Airborne Communications Node (BACN), developed by Northrop Grumman Corporation (NYSE:NOC) for the U.S. Air Force, received the Weapons System Award from the Order of Daedalians, a national fraternity of military pilots. Daedalians retired Air Force Maj. Gen. D. Bruce Smith and Vincent Caterina presented the award to Col. Cordell DeLaPena, director of the Airborne Network Division at the Air Force Electronic Systems Center, Hanscom Air Force Base, Mass., and Claude Hashem, vice president and deputy general manager of the Network Communication Systems business unit of Northrop Grumman's Information Systems sector, on Oct. 8 at Edwards Air Force Base, Calif. In selecting BACN, Gen. Schwartz said the system has "provided the warfighter an exceptional battlefield capability by interconnecting disparate data and voice networks. By closing the information gap, BACN has made significant improvements to operational command, control, and communications; situational awareness; and targeting effectiveness." Designed for use in a variety of aircraft, BACN is a forward-deployed airborne communications relay and network-centric enterprise information server. BACN extends communications ranges, bridges between radio frequencies and "translates" among incompatible communications systems to enable information sharing and enhanced situational awareness. "The Northrop Grumman-Air Force team is particularly honored to receive this prestigious award because I believe it is the first time a communications system has received an award as a weapon system. It clearly shows BACN is significantly enhancing combat effectiveness, that the system is on the 'pointy end of the spear' for our warfighters," said Hashem. Northrop Grumman originally developed BACN for the Air Force Materiel Command's Electronic Systems Center at Hanscom Air Force Base under a Defense Microelectronics Activity contract. Since 2005, the program has evolved from a prototype to today's operational, fielded system. The Order of Daedalians was founded in 1934 to honor aviators who served in World War I. The Daedalians Weapon Systems Award, as well as the accompanying Colonel Franklin C. Wolfe Memorial Trophy, is presented annually to individuals, groups or organizations judged to have contributed the most outstanding weapons system development in the aerospace environment.